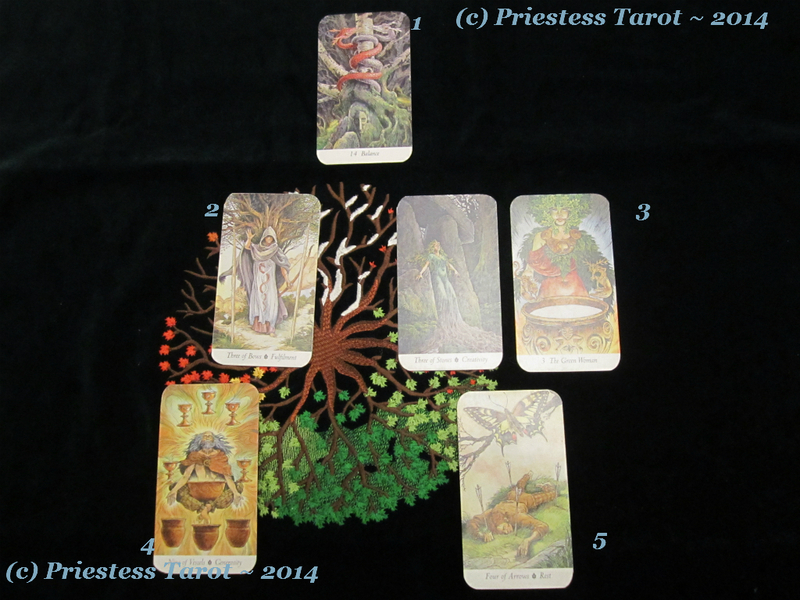 The Joy of Gifting is the theme for the last Tarot Blog Hop for 2014 is here. We’ve asked by the wrangler, Arwen, to blog about a specific spread about the Joy of Gifting. Not just gifting personally, but globally. If only the magicks worked that way! Everyone loves a present or two, don’t they? We were given a specific list of questions to answer for this Blog Hop. In fact, Arwen was very specific. Another Hop member, Morgan, created a layout for this, but you know what, I feel like making it look like a tree! I love trees of all shapes and sizes and it saddens me when they’re cut down and not replaced. Or, cut down and made into a stupid car park. So, onto the spread and lets see what useful gifts (other than anger) The Wildwood can bestow upon the Global Community this Yuletide. So, what Gift would I give to the World, if I could? Major 14 (Balance) was picked from the deck. Balance I feel, is so lacking in lots of areas in the Global community. Take a look at Syria, Afghanistan, the West Coast of Africa, The Middle East… The list is almost endless but we should be more tolerant and more in balance, more Zen. Okay, with several billion people on one small, little spinning planet, that is a tall order, but even for a day (or a short while), isn’t it worth it? In return for sending out such a gift to the World, I’d like the World to send to me some fulfilment. That feeling you get when something goes right and you make the right choice. Okay, I’m a Tarot reader and I’m supposed, maybe, to know it all, already, you know? But you know what? I don’t. No one does and I am firmly of the belief that if anyone claims they have all the answers, they’re lying or playing with you. I have no intention of doing either, for I have no energy for it. What gift have I given that has bought joy? Boy, Arwen likes extracting a whole pint of blood from you! That’s hard to work out, sometimes, but you never really know, until later, if the gifts you’ve given have ever really been gratefully received! However, I recall the first present that I ever bought my husband, was before we were married or even dating. It was his birthday, and he was a friend at the time. It was his birthday and I found in a cheap book shop, a set of juggling balls. They cost a mere one British pound, but he taught himself to juggle and entertains the children, even now. Something so simple has bought so much joy, even years after they were given as a simple gift to a friend. That was certainly the Joy of Gifting. My last note for the season, is rest. Most of you know, I have three growing, bickering, strapping children, and I wouldn’t swap them for all the tea in China and India combined. However, at some point, I know I’m going to need rest and the kids do too! The eldest two, who are school age, need their rest and need the time to catch up on their sleep after a whirlwind first term of this academic year. The little lady and her parents are no exceptions, we need our rest and the chance to recharge our batteries. My house is typical I think, in that sense. I don’t doubt that others up and down the land, or across the globe, are in the same boat. And so are the teachers! I’m sure they’re in a darkened room somewhere, with something tall and strong (and it’s probably permanently 5 o’clock somewhere!) Can’t say I blame them! So, with that Joy of Gifting ending (and some 850+ words) I pass you onto Joanna Ash’s blog entry and I merrily send you on your way, perhaps with a mince-pie, a little warm mulled wine (if you’ll have some, I personally, can’t stand the stuff) or hot chocolate. I wish you a very Merry Christmas and a Happy New Year. May 2015 be prosperous to you, in lots of ways! I can’t remember the first present I bought my husband. Lol. Great post! Hello and thanks, Machelle! I only remember because it’s a story we tell the kids, right as the balls are handed to him for “entertainment” purposes! 😉 I hope you have a great and prosperous 2015! Thank you for holding my hand through this. It was fun. My heart is fulfilled for having participated! Feel free to adopt it, if you wish. Because I add images of the cards in my readings, I only refer to the image if there’s something specific that’s jumped out whilst I’m reading. lol! Crikey! I started my spread with the gift I’d like to give as a semblance of balance too! Lovely blog post Neighbour! Cute Christmas tree layout. 😀 Here’s to a restful season for you & yours, and a very prosperous 2015. 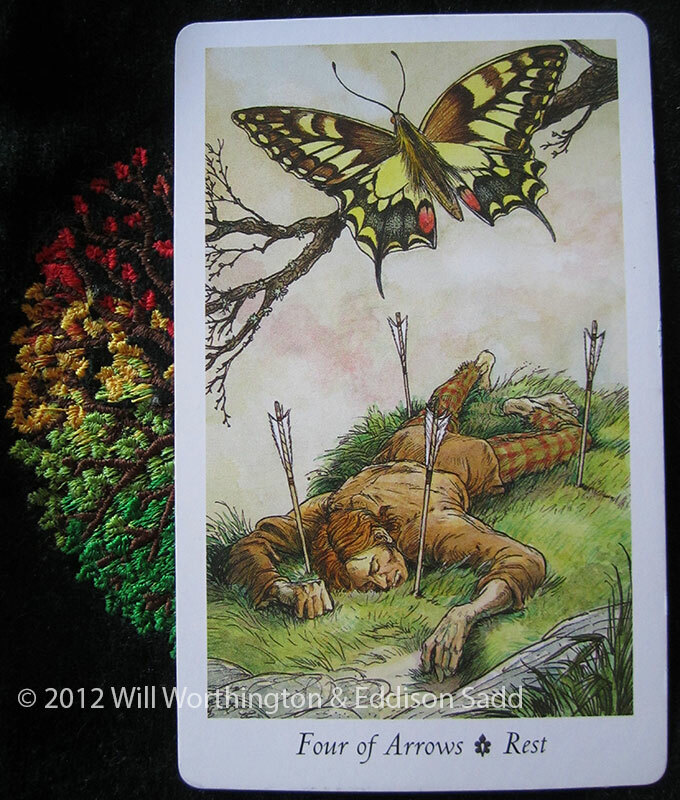 I often reflect on how I can feel like I “know it all”, or at least be a fount of endless guidance and advice when I have the tarot to direct me but otherwise can often be found floundering around about life’s issues. I think it’s wonderful to have a tool like the tarot to help me out in life, but I’m always trying to impress on people that no one can know it all and everyone has to make their own choices. Guidance is just a guide, not a how to manual of step by step instructions. Pint of blood, indeed! LOL I really like that he still juggles. Well done on remembering the present that you bought your husband. I can barely remember the last present that I bought Tartarus, never mind the first lol! Nearly there, thanks, Louise 🙂 Hope you had a wonderful New Year, and may 2015 bring many blessings to you! Beautiful cards! Good luck with your new craft projects for the year ahead, and with your new machine to play with and explore!